In the minds of these policymakers (and many voters as well), decades of government “handouts” weren’t helping the poor but encouraging a life of lazy comfort on the taxpayers’ dime. This idea was false then; people in poverty largely had no interest in staying on welfare. Claims of welfare reform’s success are equally false today. False because they derive from a fundamental opposition to government aid for the poor. In that view, federal government should be as small as possible (at least in terms of non-military spending), privatized where possible, and certainly not in the business of bailing out those at the bottom. And who are always at the bottom? The commonly held belief for at least the past several decades is that most poor people are black and that most black people are poor. While the poverty rate among black people (27% as of 2014 Census estimates) is typically second only to Native Americans, black poverty in 2015 was less than one-fourth of U.S. poverty. Generally speaking, those who are most vulnerable to poverty in this nation are women, people of color, and their children. Seniors and people with disabilities are entitled to public assistance programs like Social Security, SSDI or SSI. But working-age able-bodied individuals and families are not. These are the people hit hardest when legislators decide to make government’s primary aim the creation of wealth and the protection of the wealthy. They are first to suffer when government prioritizes corporate over human interests, and when it frees businesses’ reign over our workforce, health, environment, and even government services. It was amid this kind of rampant deregulation that federal legislators ramped up their demands of “welfare queens.” Sixty years after government created cash assistance for families mired in poverty, the desperate now had to jump through far more hoops before they were deemed worthy of help, and there was now a five-year lifetime limit on assistance. Lawmakers designed the new welfare system to minimize compassion and maximize opportunities for judgment – stigmatizing and punishing single mothers who are trying to raise their children. As part of this welfare reform plan, the federal government shifted its $16.5 billion cash assistance budget to the states as block grants to use on Temporary Assistance to Needy Families (TANF) programs as they saw fit. As advocates had feared, the states often chose to direct that money away from those in desperate need. 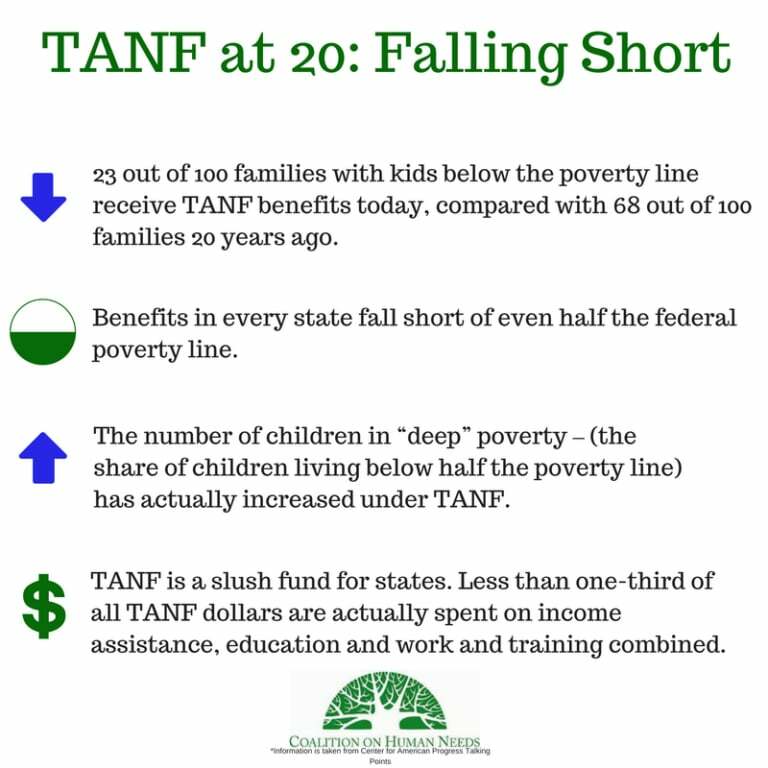 Today, only one in three TANF dollars actually funds basic assistance to those in poverty (and you may be shocked at how the other dollars are used). Only one in four of eligible families receive it, and the assistance amount is far too low. (In Pennsylvania, it has been frozen since 1990.) The job training and education programs that make up TANF’s”welfare-to-work” requirements are not particularly effective and drastically underfunded. Those who would argue that TANF is moving people from government dependence to self-sufficiency cite the increase in the official employment rate of single mothers between 1995 to 2000 (61.7% to 73%) as well as declining welfare caseloads. But the employment numbers have since slid nearly all the way back down for a variety of reasons. And “shrinking rolls is not evidence of success,” as our executive director Ken Regal told the Pittsburgh Post-Gazette. In Pennsylvania, welfare rolls fell by more than 70%–from 531,000 people in August 1996, to less than 158,000 TANF recipients 20 years later. Meanwhile, deep poverty in this country has grown. TANF policies thwart the very self-sufficiency they claim to promote. For many recipients, every baby step forward towards low-wage employment then means two steps back when their cash assistance, child care support, and food stamps gets reduced. It was only last year that Just Harvest and our allies finally won the ability for Pennsylvania’s TANF recipients to complete a two-year degree program before being kicked off assistance. Twenty years after the “success” of welfare reform, almost half the nation’s young children live in poor or near-poor families. Most of these families have a working parent, but in our country parenthood causes poverty. Why? Because the minimum wage is a poverty wage for a single person, much less a family, and low-wage jobs typically don’t offer predictable scheduling and hours. Because too many jobs don’t offer any family and medical or sick leave, much less paid leave. Because labor unions have been systematically destroyed, and with them the wages and job protections they helped provide for all Americans. Because there is an overall shortage of affordable, high-quality childcare, and only about one in six children eligible for subsidized childcare receive it. Because federal and state lawmakers are constantly trying to put barriers to SNAP eligibility, making it even harder to get food assistance. Because there’s a massive shortage in affordable, safe housing and no protection from unfair eviction, which hits families even harder. Because every assistance program lives under a looming axe. Charities are incapable addressing these root causes of poverty and filling the enormous gaps these policies create. It requires system-wide change. Contrast the ease with which we give various subsidies and tax breaks to corporations and the rich with the scrutiny and harsh judgment that accompanies government assistance to the poor. Those who proclaim the success of welfare reform simply don’t extend its principles to handouts to the wealthy. The result? The distance between poor and wealthy Americans–both in terms of wealth and social mobility– is now as huge as it’s ever been and getting ever wider. For that reason welfare reform can only be understood as a continuing failure. It is now time for a new set of reforms.